Prices on any web page are found and automatically converted using the currency exchange quotes. Supports all ISO 4217 official currencies: $, £, ¥, ؋, ฿, ₡, ₦, ₨, ₩, ₪, ₫, €, ₭, ₮, ₱, ₲, ₴, ₵, ₸, ₹, ₺, ₼, ₽, etc. Conversion is shown and hidden from the toolbar button. 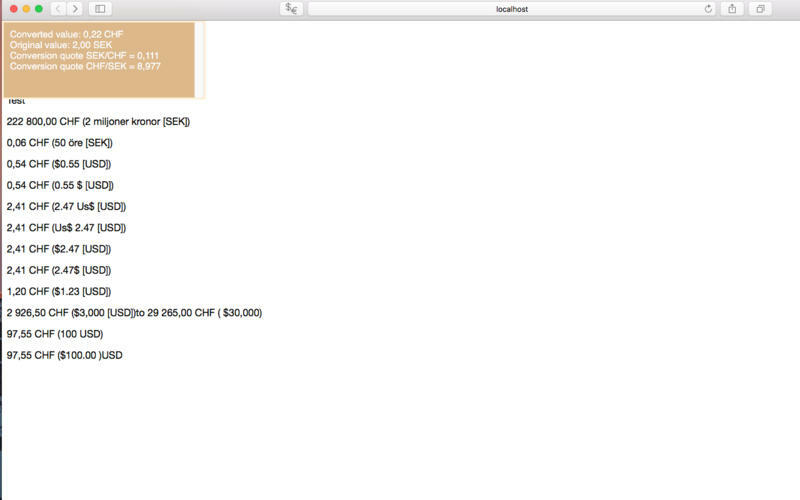 Original prices are optionally shown, as well as the conversion quote. It is also possible to convert all numbers on a web page even if no currency is shown, which is handy if you have for example a price list for which you know the original currency. 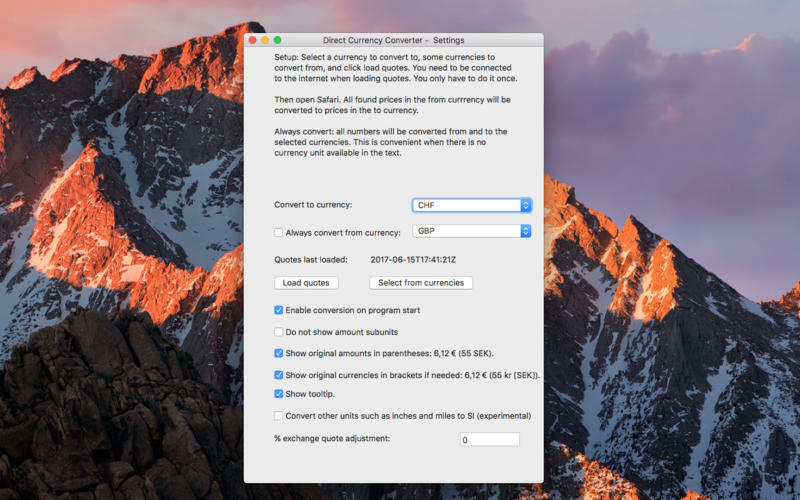 To setup conversion for the first time, be connected to the internet, launch the app, select currencies to convert from an to, and save. Conversion quotes and settings will be stored and used when Safari is launched. Also first time, enable the extension in the Safari settings. To change the settings, launch the app again and restart Safari. This is a Safari App Extension, which means that it will work together with the Safari Browser, version 10 or later, on macOS. It is also available as a traditional Safari Extension. It is written in Swift 3 and ECMAScript 2016, and the version number is taken from its Safari Extension sibling, having the same features where possible. Added new setting to select between currency symbol (€) and currency code (EUR). Improved conversion tooltip: bigger and showing all conversions in the selected paragraph. Added more cyrillic search patterns for USD.